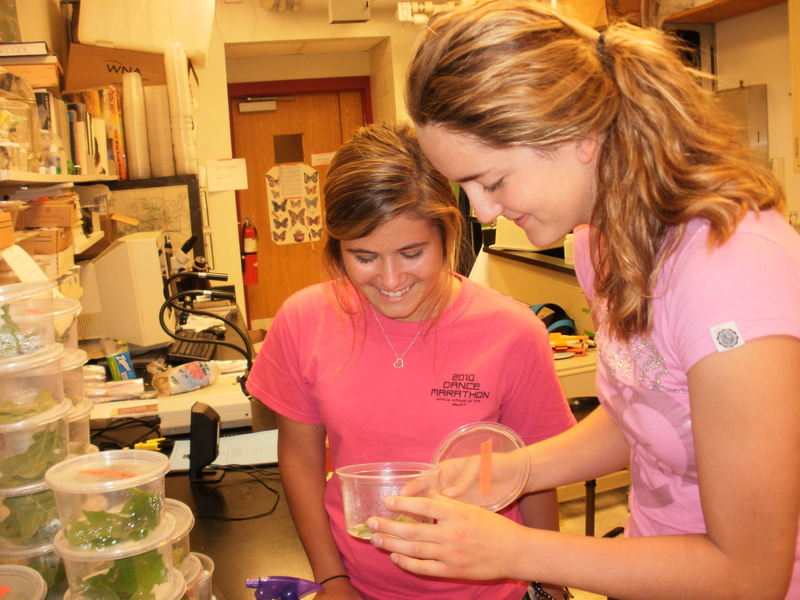 High school students Taylor Voelker (left) and Andrea Herman are getting six weeks of hands-on science research in the STARS program at UMSL. The clay caterpillar looked real enough to eat, as evidenced by the bite marks on it. High school senior Andrea Herman is spending her summer sticking the fake bugs into Honeysuckle bushes to see if the invasive plant helps or hurts native insect species. This is part of her research project in the STARS program at the University of MissouriSt. Louis. The program is sponsored by LMI Aerospace Inc./D3Technologies and The Solae Company. It pairs students and teachers with research mentors from UMSL, Saint Louis University, Washington University in St. Louis, the Donald Danforth Plant Science Center in Creve Coeur, Mo., and Solae. For six weeks, biologists, chemists, computer scientists, engineers, medical researchers, psychologists and public health experts from the five institutions will take on student apprentices in laboratory settings and direct students in research projects. Participants in the program include 78 students from 38 high schools in the St. Louis metro area. Herman, 17, a senior at Villa Duchesne High School in Frontenac, Mo., and Taylor Voelker, 17, a senior at Parkway North High School in St. Louis County, are working with Robert Marquis, professor of biology at UMSL. Voelker is comparing whether caterpillars are less likely to get eaten if they are wrapped in leaf ties little leaf shelters they make themselves or if they can remain safe exposed on a single leaf. "My hypothesis is that shelter is best," Voekler said. "My project helps determine the importance of the caterpillars' role in the ecosystem." Both Herman and Voelker said they heard rave reviews from last year's STARS participants and applied to the program as a way to figure out what they wanted to pursue in college. "This is a way for me to tell if I want a career in science or the humanities," Herman said. Taylor said she's thinking of going into research science and STARS provides her hands-on experience and an opportunity to learn what working scientists do. Both students said they love their research, much of which takes place outside of the lab in Cuivre River State Park in Troy, Mo., and the August A. Busch Memorial Conservation Area in St. Charles County, Mo. "It's great except for the ticks," Herman said with a laugh. She and Voelker are also fans of the STARS speaker series that brings in scientists from all different fields to discuss their work. "The series gives you the whole spectrum of science," Voelker said.